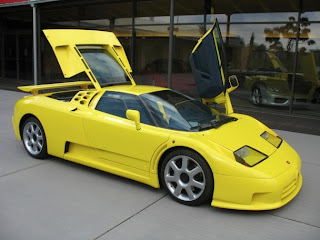 The Bugatti EB110 is another one of those cars that fits into the Show or Display requirements pretty well. It was sort of an orphan car. 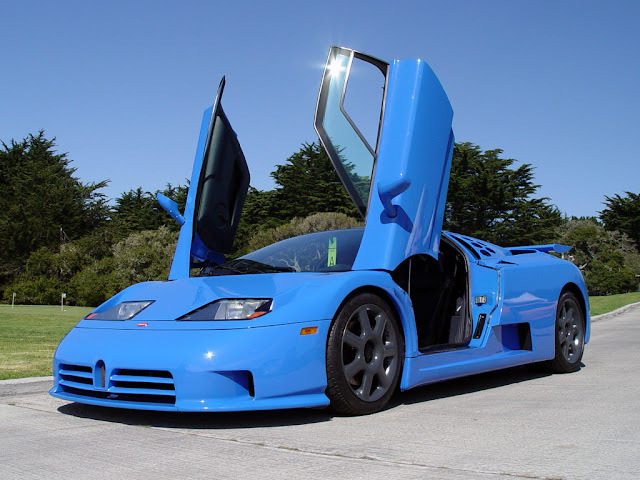 Bugatti eventually went bankrupt and was purchased by VW. However before then they built 139 of these 3.5 liter V12 quad turbo EB110's. The car has a 60-valve, quad-turbo V12 powering all four wheels through a six-speed gearbox. The 3.5 L (3499 cc) engine has a bore of 81 mm (3.2 in) and a stroke of 56.6 mm (2.23 in) and is capable of 553 hp (412 kW; 561 PS) at 8000 rpm. Acceleration to 100 km/h (62 mph) takes 4.9 seconds, and the GT has a top speed of 213 mph (343 km/h). The car uses a double wishbone suspension, with the chassis built by Aérospatiale, an aircraft company, and made from carbon fiber. Equipped with Gandini's famous lifting scissor doors, it has a glass engine cover that provides a view of the V12 engine along with a speed-sensitive electronic rear wing that can be raised at the flick of a switch. The shift-knob is placed closer to the driver so that less time is taken to shift. Five pre-production prototypes with aluminum chassis were built, followed by eight with composite chassis. Following these, it is believed that only 95 GT and 31 SS production models were constructed. A vehicle eligible for Show or Display may receive NHTSA approval to be driven on the highway. The odometer must not register more than 2,500 miles in a 12-month period. NHTSA approval of limited on-road use is to allow the vehicle to be driven to and from nearby displays of similar automobiles. Another reason permission is granted is to maintain the vehicle’s engine, braking, lighting, and other dynamic systems in good working order. The vehicle is still required to meet EPA requirements. If the original engine in the vehicle will be replaced with a non-original engine to meet EPA requirements, it must be identified in your application since it may impact on the technological or historical significance of the vehicle. Email me if you need help importing vehicles.